Artist Farrah Karapetian is visiting St. Petersburg as a resident with CEC ArtsLink and will introduce her work in photography and sculpture through a brief slide show on May 22th at the FotoDepartament. Following this introduction, she will discuss issues of subjectivity in 21st century photography with Egor Rogalev, St. Petersburg-based photographer. Why do we trust the photograph uniquely among all artworks? How do artists working in photography today subvert that paradigm, and why would they want to? Farrah Karapetian makes photography physical. Her large-scale, vibrant, camera-less photographs are produced using constructed negatives, or handmade props, the artist fabricates in transparent materials to infuse unexpected texture and volume into otherwise flat, opaque shadows. Karapetian’s work usually intersects with public and political spheres. The concerns of previous series span war veterans, protestors, and stagecraft. The through line for Karapetian is the need to filter public imagery by deconstructing the act of looking and rebuilding it as personal, somatic, and expressive photographic practice. Karapetian was born in Marin, CA, in 1978. She received a BA from Yale and an MFA from the University of California Los Angeles. Upcoming exhibitions include A Matter of Memory, George Eastman Museum, Rochester, NY (2016); About Time: Photography in a Moment of Change, San Francisco Museum of Modern Art, CA (2016). Her work is included in the collection of SFMOMA and the Los Angeles County Museum of Art and illustrated in Charlotte Cotton’s Photography is Magic, published by Aperture (2015). The artist lives and works in Los Angeles, CA. Egor Rogalev was born in St. Petersburg, Russia, in 1980. He studied at the Saint Petersburg State University. 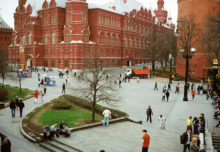 In addition to exhibiting in Moscow and St. Petesburg, he has exhibited throughout Europe. His work in landscape photography interrogates the notion of photographic storytelling and often purports to unpack the political charge of environments, moving through layers of their constructed identities in search of – but never finding – the truth. 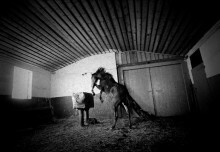 His works are represented by FotoDepartament gallery.